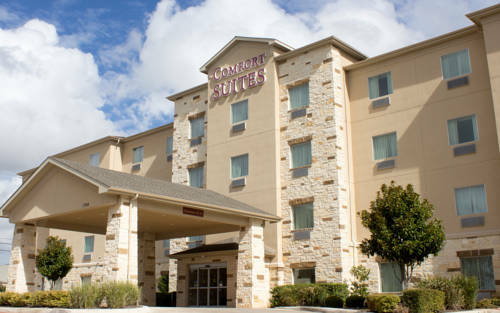 Get more of the space you need to spread out, relax or work at the smoke-free Comfort Suites San Antonio North Stone Oak hotel in San Antonio, TX near SAT Airport. Nearby destinations include the Majestic Theatre, San Antonio Botanical Garden, Morgan's Wonderland, San Antonio Museum of Art and San Antonio Zoo and Aquarium. ATandT Center, River Walk and the Alamo are also close. Enjoy amenities like our banquet and meeting facilities, business center, free hot breakfast, free WiFi, Sundry shop and fitness center. Additional amenities include a seasonal outdoor pool with sundeck and guest laundry facilities. Also, earn rewards including free nights and gift cards with our Choice Privileges Rewards program. All Comfort Suites are 100 percent Smoke-Free. $150 fee for guests smoking in guest rooms.